Homebrew projects	- 23 cm. Kits available on Heelweg convention 2016!! 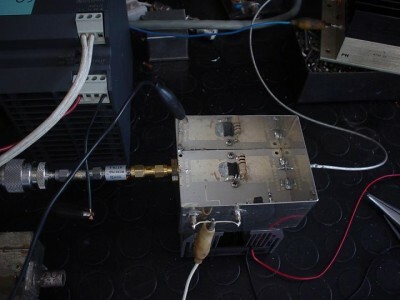 During the visit of G4DDK and G4BAO here in The Netherlands to visit the Heelweg conference 2010 John made me very interested about his design of a 50W lineair Power Amplifier for the 23 cm band. Therefore I ordered a kit from John G4BAO. A few weeks later the kit was delivered by normal mail. All important parts were in the kit, as showed in the picture below. 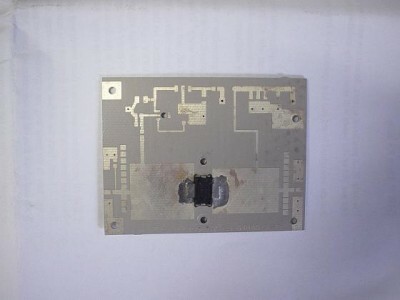 The "device" an LDMOS motorola MRF9045 was premounted on the printed circuit board, complete with a small copper plate, this for proper cooling of the heath produced by this device during operation. What was not provided in the kit were 2 SMA connectors a tinned box, feed-through capacitors and an suitable heath sink. This last part I found in my junkbox, and old heath sink complete with 12 V fan out of a PC with AMD inside, used for cooling the processor. The advantage of this are the small dimensions, the disadvantage is it makes noise. with 1,1W input 40W output, now the amp has been tuned (1252 MHz). John says the PA can be used up with 3W drive maximal. Since I cannot produce this drive power I did not measure this. Off course I do want to know what this PA does with this drivepower. Maybe someone who will build this ampifier? Tuning of this amplifier can be done by shorting one or more small parts on the PCB near the input and output circuit on this board by soldering these with peace of blanc wire. This looks like tuning microwave circuits with small pieces of copper shims. However shims are not nessesary, they are on the PCB. At my PA the most effect was acheived by tuning the output circuit, the input can be tuned as well. This however had no significant extra gain or output power as result. The PA needs a supply of 28V and uses about 2.8 A for the measured 40W, this with an bias current adjusted to 350 mA. Below a picture of the contents of the kit. 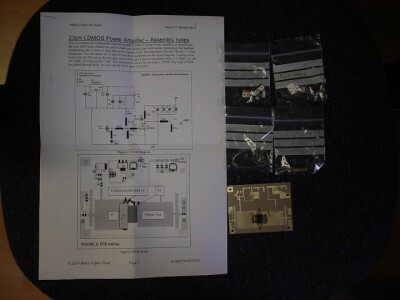 Here below a picture of the pfte PCB with the pre mounted LDMOS-fet. The builded PA "on test". Again the PA "under test". Near the input and output connectors you can see the tuning parts on the board, this is still not tuned. Good luck with building the excellent designed power amplifier.